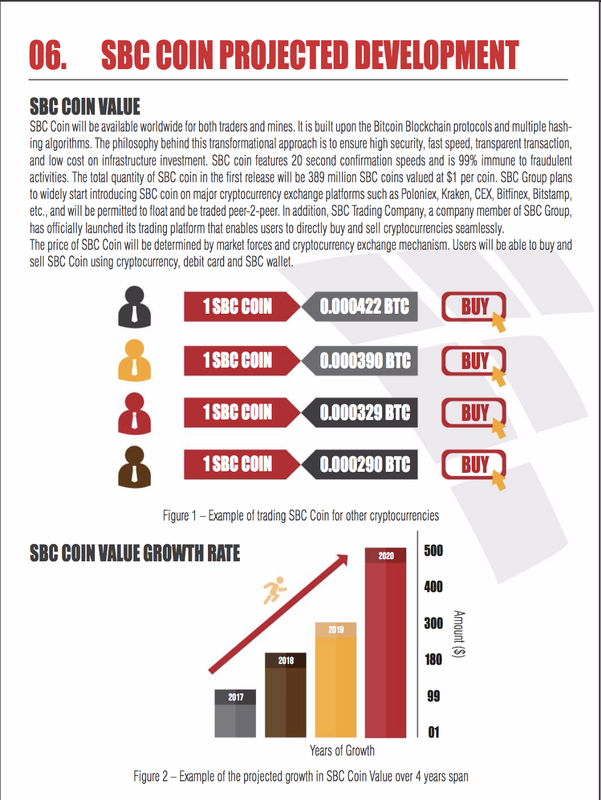 The recent release of SBC Coin by SBC Group, a U.S-based company, marks a bid to provide the world’s safest cryptocurrency through the use of advanced blockchain technology empowered by multiple hash algorithms, wrapped with SHA 256 and SHA3–512. The coin also feature a hybrid Proof-of-Stake (PoS) and Proof-of-Work (PoW) algorithms, offering security in addition to stakeholder incentives. SBC Coin will feature 20-second confirmation speeds and be 99% immune to fraudulent activities. The coin uses the concepts of tree hashing to provide the highest possible performance on a single buffer in a single thread of a single core of a modern microprocessor. Critical uses requiring fast hashing of a single buffer include secure loading of files during boot/resume of a system, and streaming applications where it is not feasible to buffer many streams for later processing. The multiple hash algorithms have been tested by Intel, according to Dr. Samuel Lorenzo, chief technology officer of SBC Group. The company has already offered up to 389 million SBC Coins to both public and internal-community miners through its ICO, which is currently under way. The combination of PoS and PoW algorithms is a key aspect of SBC Coin’s architecture. PoW deters cyber attacks, thereby enhancing the coin’s security. PoS allows miners to have incentives to provide consensus solutions for blockchain transactions. 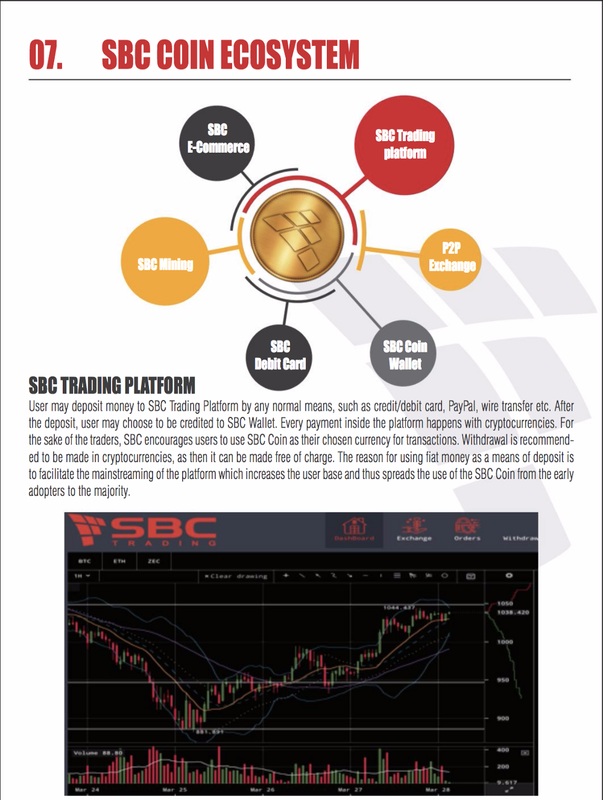 The SBC eco-system consists of six core elements: SBC coin trading platform, peer-to-peer exchange, SBC coin wallet, SBC debit card, SBC coin mining and SBC commerce. The wallet will be available on iOS, Android, Max OS X and Windows. It will be easy to use the same wallet or accounts across multiple devices. 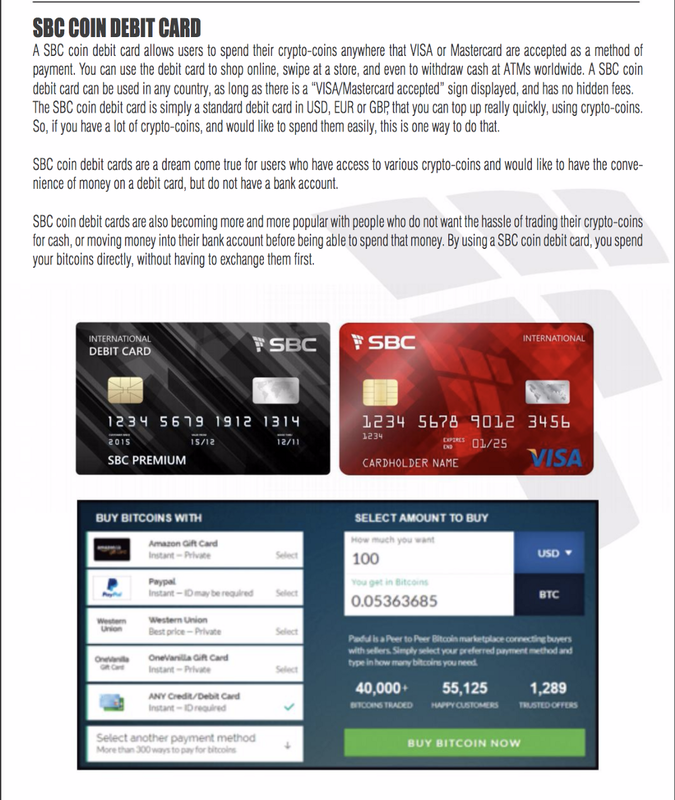 The SBC Coin debit card will allow users to spend their coins anywhere VISA or Mastercard are accepted. Users will use the card to shop online, swipe at stores and withdraw cash from ATMs worldwide. The card will be usable in any country that accepts VISA and Mastercard, and will have no hidden fees. 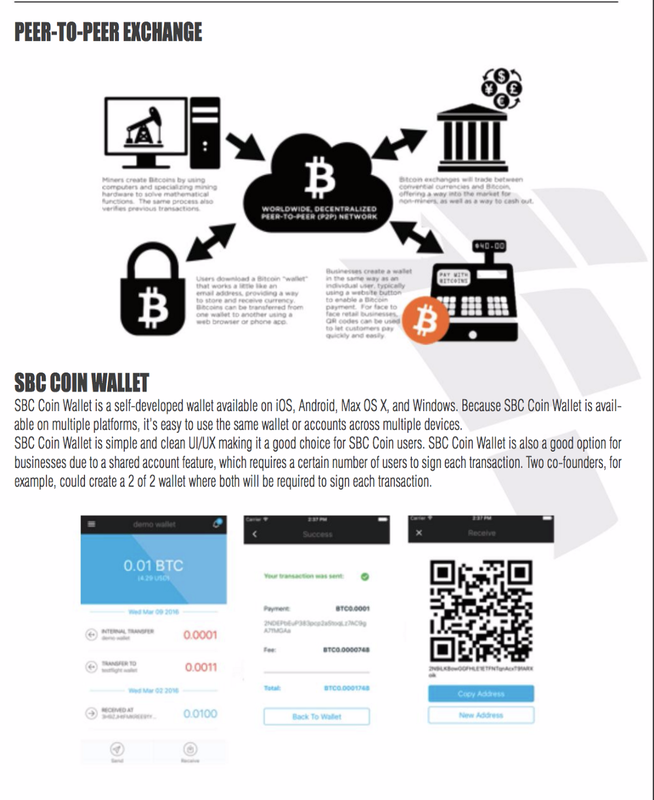 SBC Group’s goal is to empower both miners and traders with products and services that change the way cryptocurrency transactions are made. 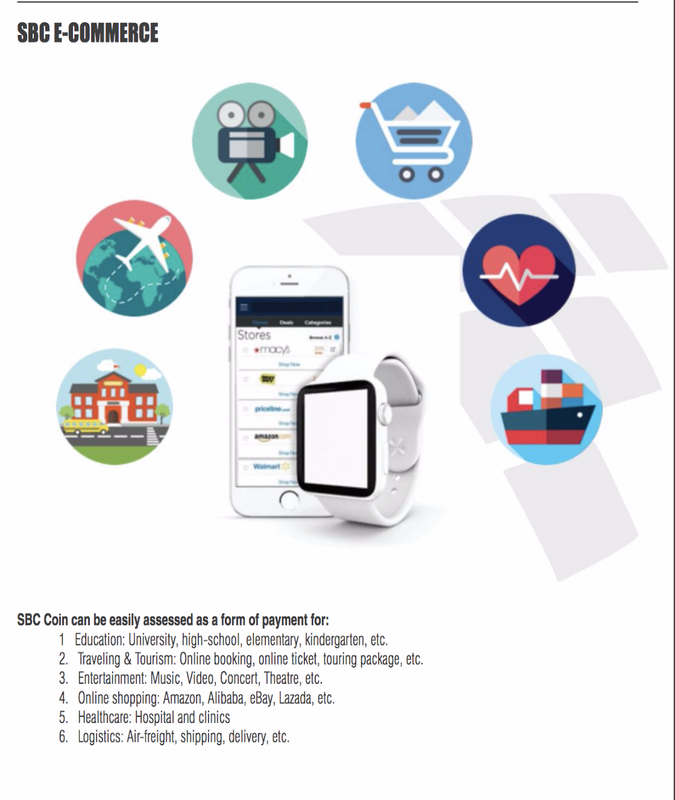 Long-term, SBC coin seeks to transform digital currency from non-physical to physical currency, and provide a community payment system for customer needs. A total of 175.05 million coins will be offered in an ICO from Sept. 15 to Oct. 29, 2017. SBC wallet, SBC debit card and the SBC trading platform will be entitled to 10 million coins for a single ICO. The remaining 145.05 million coins will be invested in employees, the mining system, marketing and development. During stage 1 of the ICO, investors will receive 30% of the purchased coins. During stage 2, they will receive 20%, while during stage 3 they will receive 10%. 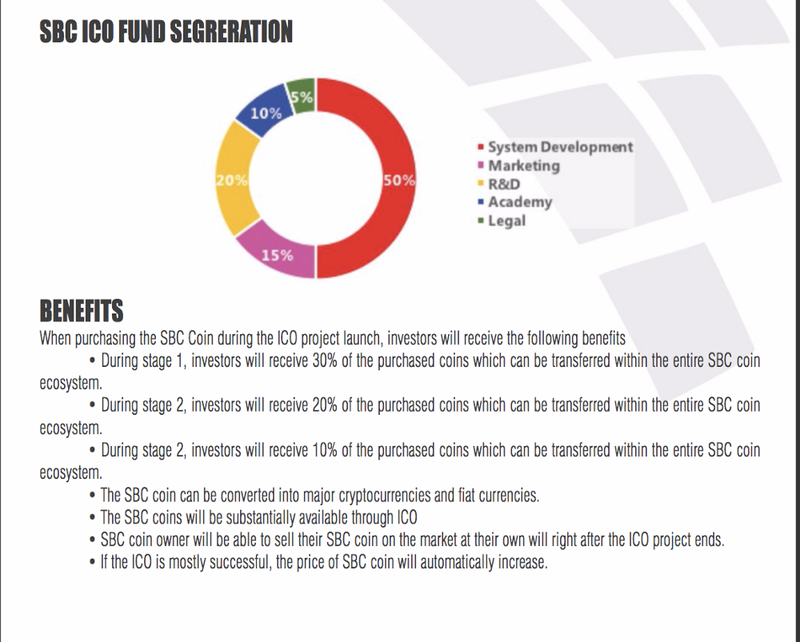 SBC coins can be converted to major cryptocurrencies and fiat currencies. SBC Group will accept various forms of payment for those who prefer to use their own cash or cryptocurrency. SBC Group plans to introduce SBC Coin on Poloniex, Kraken, CEX, Bitfinex, Bitstamp and other exchanges. 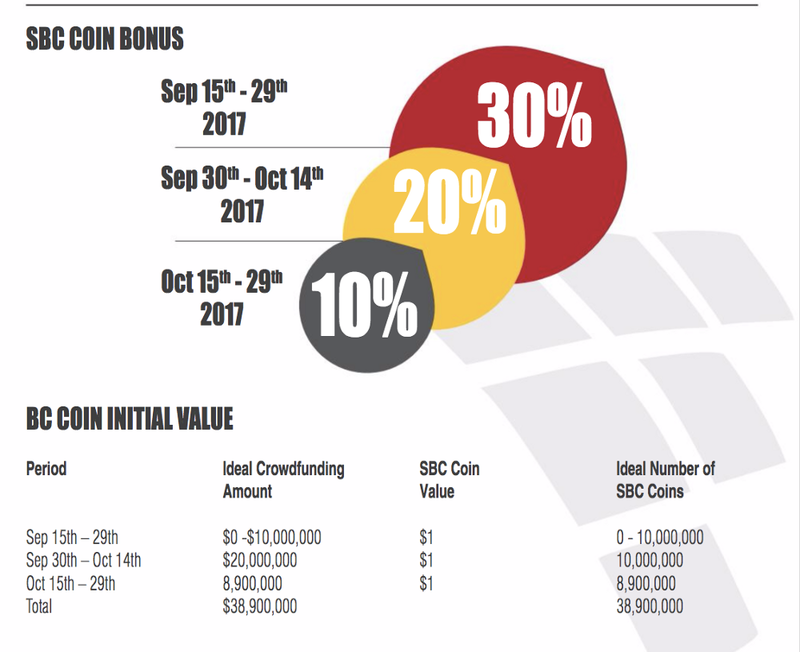 The company expects the coin to expand at a growth rate of 635% to 695% over the next three years, giving investors a chance to win an average ROI of 120% to 125% annually, according to Frank Sanders, SBC Group co-founder. SBC ticker is already taken. Best to choose something else. ZPOOL - the miners multipool! Support | Paid 1150+ BTC(2016) - 1800+ BTC(2017) | Mining LTC/LCC/BCA/DASH/KMD/ZCL/RVN | UNBELIEVER | Check out our NEW website! Good idea and very detailed! I will invest in coin on the floor! Hope to invest effectively! together developed! The coin uses multiple hash algorithm, so my question is how to mine this one. I have some rigs which have AMD graphic cards. Thanks all. "Be wise like a serpent, be humble as a dove"
What is the mining specs? I think the mining will start on 2019... hahaha I think that's too far. There is more coins created in that time, and people no more time to mine SBC. Good luck. StrikeBitClub (SBC) is listed on CoinCodex! Best way to LONG/SHORT Bitcoin. Up to 66x leverage. Register on BitMax now! who are the team behind this coin and. how do we know its not a scam. also would like to see the white paper. clearly you didn't visit the site, register, contact the team, interact with the site or read anything. just another mindless investor. How can I participate in the bounty program? Mining? LAST_POW_BLOCK = 10000. Now last blocks - 129373. Premine - 194500000 coin. is this only a pump and dump coin ? whats up with this coin?